Grilled chicken breast and steamed broccoli is one of the staple meals of sportsmens (especially weightlifters). I once even met a dude at the gym who told me he was sick of preparing different meals and was seriously considering just eating that for every meal. I mean, chicken and broccoli is an easy and quick meal to prepare, it’s also pretty healthy and tastes okay; but twice a day, every single day? Let say it out loud: BLAH! On top of that, how boring can it get to eat the same thing over and over again? I won’t deny it though, I have been down the chicken+broccoli road before. In college, when all of a sudden I was cut off from the wonderful homemade meals of my far away home, and flung to a universe wherein basically I had to cook or die starving. Grilled chicken and steamed/boiled broccoli (with a side of brown rice) pretty much saved my life. Because in college you don’t really have the money to buy many ingredients and it’s also a huge effort to cook (you know, washing the dishes and all). 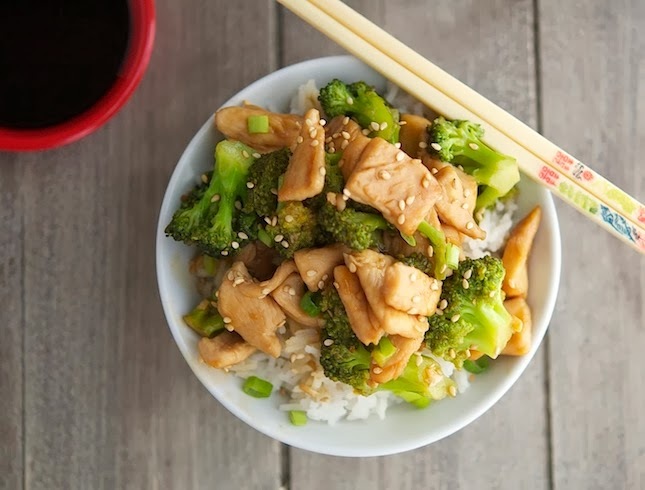 Chicken and broccoli is a cheap, quick, light, healthy and filling option. But nowadays...nowadays I have perfected my cooking skills, and I can make complicated sounding dishes with monosyllabic names. 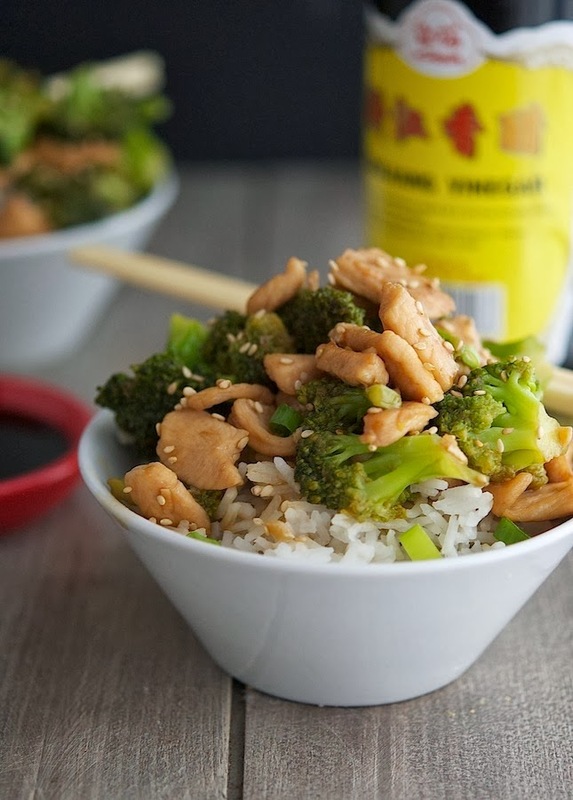 Chicken and broccoli is no longer plain and boring; it’s Chinese chicken and broccoli. It’s exotic, fancy and worth a 3 starred restaurant. The thing I love about Chinese chicken and broccoli is the sauce and the freshnes of the broccoli. I’ve tested/tweaked all sorts of recipes and I think this is the ONE. The sauce has the perfect texture and creaminess, and the broccoli have the right amount of crispness. All in all, a perfectly healthy and delicious weeknight meal! 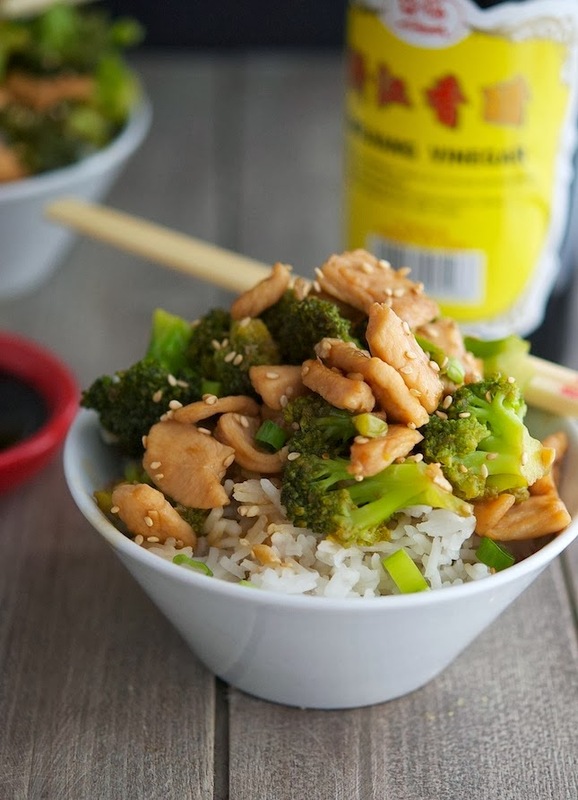 Chinese Chicken and Broccoli (Low Carb & Gluten-Free) Print this recipe! In a small bowl combine all marinade ingredients. Combine chicken cubes and marinade in a Ziploc bag (or a shallow container) and refrigerate. In the meantime, bring a pot of salted water to a boil. Blanch the broccoli florets for 2 minutes, drain, run under cool water (to stop the cooking) and set aside. In a small bowl combine all sauce ingredients. Heat one tablespoon of olive oil in a wok (or large frying pan) over medium-high heat; once sizzling, add chicken with its marinade and ½ of the sauce and saute cook for about 8 to 10 minutes. Transfer to a plate. Return the wok to the stove and heat remaining tablespoon of olive oil over medium-high heat until sizzling. Add broccoli and saute for 1 to 2 minutes until slightly charred. Quickly add chicken and remaining sauce and cook for further 2 minutes until the sauce thickens. One serving yields 326 calories, 17 grams of fat, 13 grams of carbs and 29 grams of protein. If it is half as good as the Spicy Orange Chicken and the Mongolian Beef...I am sold!! YUM!!! Awesome Lauren, would love to hear a report back when you try this recipe! I hear you Lauren, but this recipe is deffo worth a shot! This is awesome! I added some carrots and celery to bump up my veggie content and served it over quinoa. So glad I got around to making it. Thanks Mike! That's great Lauren, I'm super happy you liked it! I should try it over quinoa as well, sounds so yummy! So you still convinced you cannot open that Chinese/Asian/Fusion restaurant? There's something about college that makes you eat the same thing over and over again, I wonder what is it? We could do some research, I'm sure we will find something! Have a great weekend yourself Shashi! Thank you for sharing this gluten-free recipe! Most asian dishes have gluten, so this is great! Another great dish. Love the sesame seed sprinkles! Sesame seeds are MUST when dealing with Asian-inspired food! 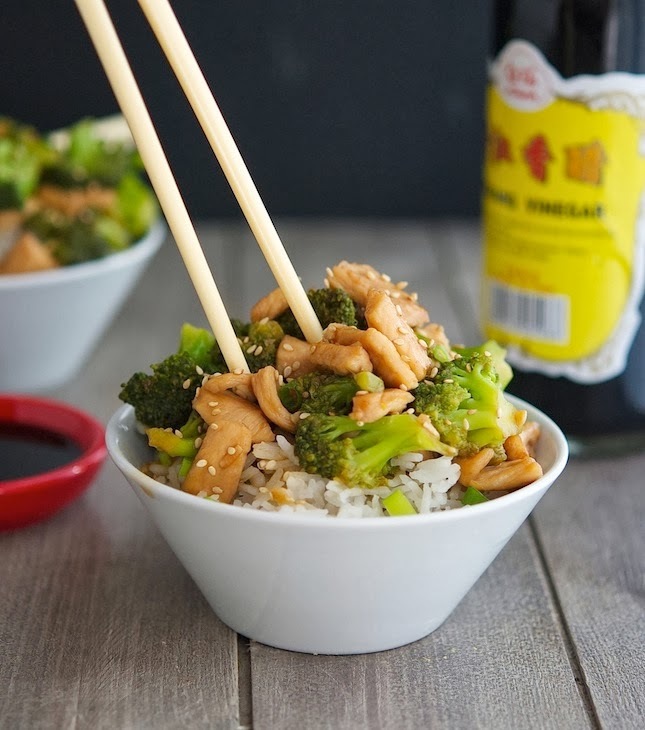 Chicken and Broccoli is like my staple, go to order when we get Chinese take-out. Super excited that I can try making it at home now. Great looking recipe Mike! Thanks Chris, I hope it lives up to your (high) expectations! Love that you marinade the chicken before hand, usually I just throw it all in and stirfry it up. But this marinade adds another layer of flavor that is probably awesome! Great recipe Mike and love that it is gluten-free.. WIN! The marinade is killer Krista; it's the thing that makes the whole dish taste 100x better! Enough with the Asian food already! You are torturing me! And are you sure you're not truly Asian, or of Asian descent? Wow man, your food looks crazy good. If I lived closer, I would definitely order take out from you. Or well, try, anyway! I'm sure I could come up with a few decent bribes that would make a deal irresistible. No Asian DNA in me, I promise just a deep love for Asian-inspired food. BTW if you lived nearby there won't be any need to bribe me, I would happily have you over for dinner whenever!